My boxes arrived on Monday, about 1/2 an hour before I and my parent left for a suite to escape the delightful sound of concrete being removed with a jack hammer and the subsequent dust. So still no art. I have spent the last week locked into a small luxury condo with two whiny elders. The carpet is too lush, the chairs won’t slide…. Tomorrow we head home and eventually I will make it through the mess to my room to unpack my boxes, or at least the ones with my clothes and books. Anyway, one of the things my parents have is a wall hanging I created in the early 80’s. Back in the 80s I escaped the Edmonton winters and moved to Vancouver. On Granville Island I discovered Barbara Heller. Barbara does the most wonderful tapestry weaving. I fell in love and took several workshops from her. I learned more about colour from Barbara and tapestry weaving then any other course I have ever taken. 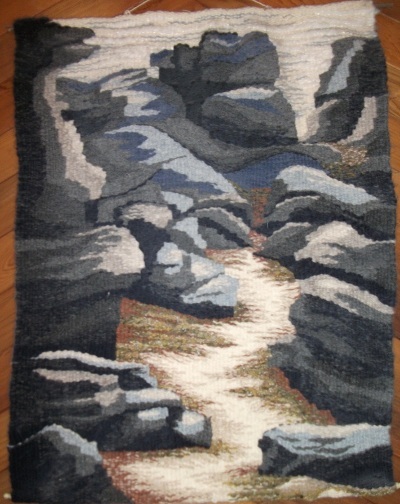 At that time Barbara was doing a lot of images with rocks and just starting her ghost images so the tapestry my parents have is definitely derivative of her work. It is based on a path to the beach on Hornby Island. I had friends living there, home steading. It is a gorgeous calm lovely island. I did a few more tapestries which family and friends own but they are very time consuming and when I was pregnant with my youngest I found it impossible to sit in the position I needed for the many hours it takes. 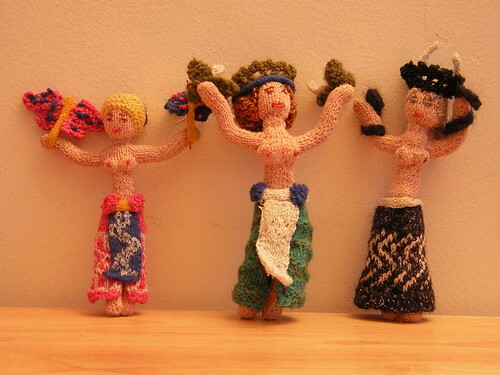 Of course after Vanessa was born, large blocks of time disappeared and instead of weaving I started knitting small dolls, something small, portable and easily put down. These dolls are about 6 inches tall. They are the first dolls that eventually grew into the ones I make today. This will be a short note with nothing much about art in it. My art supplies are either in that “safe place” or in a box somewhere in transit. I arrived in Edmonton last week. This week has been all about beginning to settle in and preparing for the big renovation to the bathroom. I have shuffled things around in the kitchen because both my sister and mother are several inches taller then me and things kept falling on my head when I was trying to reach for them. Also climbing on a chair in front of the stove while cooking, to find an ingredient really wasn’t safe. The most interesting thing about this process was a jar of crunchy peanut butter from the 1997. I have not yet had the courage to face the canned goods which are everywhere. In case of a major problem we have enough canned beans, soups and fruit to last for many weeks if not months. Last spring I tackled the packaged food, much of which had expired five or more years ago, some of which were growing interesting new life forms. My boxes are still somewhere between Montreal and Edmonton with all my clothes, art supplies and stuff, which is good in a way as we had no place yet to put it. We finally cleared a lot of the studio to be and it is actually bigger then I had expected. The light is better too, even though it is a basement it gets the sun most of the day and the windows are quite big. We found some oil paintings I did way back when I was 16, they have been recycled so don’t expect to see any pictures of them. We did some reno work on the furnace room so we could store a lot of the tools and screws, nails and other bits in there. I won’t be able to get set up the studio however, until after the bathroom is renovated as we need this space for storage for what is in the bathroom right now. It is like a giant messy Rubics cube. Reno starts in about a week and will commence with the breaking up of lots and lots of concrete to fix the plumbing issues. So right now it is all about hurry up and wait. The only “art” work I am doing is designing a pair of fingerless gloves/wrist warmers for my granddaughter to match the hat I made. One thing though, my asthma is much better then it has been in months. Where in Montreal last month, walking several blocks made me breathless and gasping, here I am hauling boxes of flooring, doing light reno work without difficulty. I guess the stress of the situation was really taking a tole on my health.